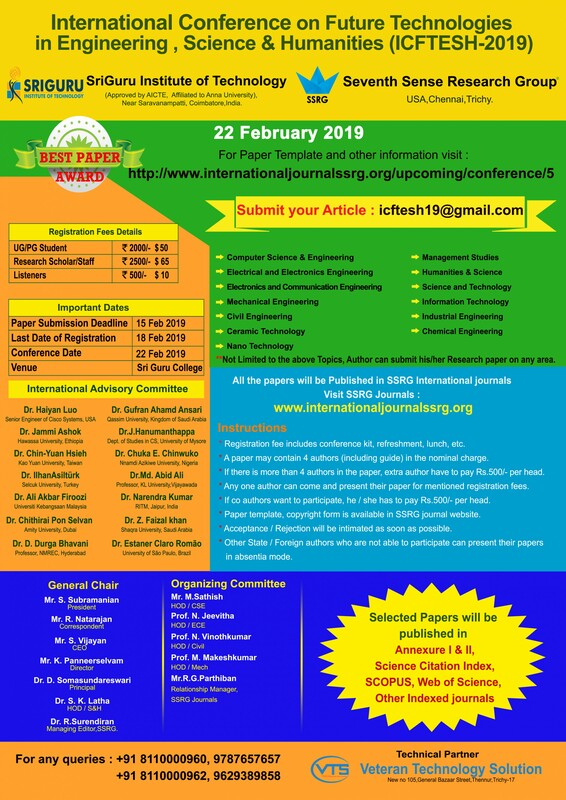 The aim of ICFTESH-2019 is to bring all the research domains together on a single platform. This conference will bring the research communities of different fields together at one place to share their researches and ideas. Also the purpose of this conference is to implement the researches of one field into another to bring out the best applications of these researches. ** A paper may contain 4 authors (including guide) in the nominal charge. ** If there is more than 4 authors in the paper, extra author have to pay Rs.500/- per head. Marudamalai Temple is dedicated to the Hindu deity Lord Murugan or Kartikeya and is situated atop a hill of the same name. The hills are a part of the Western Ghats and the surroundings are picturesque to look at. The Temple complex is built in a unique Dravidian style which is 1200 years old and its colorful gopuram is amazing to look at. It is also considered that the hills are a home to various types of medicinal herbs. Lord Vinayagar or Ganesh is the main deity of the temple. Eachanari Vinayagar Temple is considered to be consecrated in 1500 AD. Temple is famous to its massive 6 foot tall idol of lord Ganesha and is one of the biggest idols of the deity in south India. The best time to visit the temple is during the Hindu festival of Ganesh Chaturthi. Perur Pateeswarar Temple is dedicated to the Hindu deity Lord Shiva and was built by the Cholas and is considered to be thousands of years old. The stone carvings inside the temple and its pillars are breathtaking and are few of the finest specimens of the art. The temple is said to be located at the spot where Lord Shiva himself performed the ‘Tandav’ dance. The golden statue of Lord Natraja (Shiva) is also one of the major attractions here. Parambikkulam Wildlife Sanctuary is located at the Western Ghats and is bordered by the states of Kerala and Tamil Nadu. The protected forests are spread across 285 square kilometers. Parambikkulam Wildlife sanctuary is also a tiger reserve and a protected habitat of several endangered species. The forests are also a home to 4 tribes which are indigenous to this area. Located near the dam built on the Siruvani River, the Siruvani Waterfalls are located 35 kilometers west from Coimbatore. The Siruvani River’s water is considered to be one of the best tasting in the world and is one of the top tourist attractions in Coimbatore. Anubhavi Subramaniar Temple is situated at the outskirts of Coimbatore and situated on top of a hill. The temple’s location is one of best view point that provides panoramic views of the Western Ghats. One must climb a thousand steep steps to reach the temple. The temple also has a natural water spring that spouts water throughout the year. It is a unique yogic temple, beyond any particular faith and believes in spiritual essence of living. They don't follow any special kind of prayer or ritual. They only believe in meditation and provide you with a serene and spiritual ambiance in the midst of dense forest, essentially at the foothills of Velliangiri Mountains, 30 km from west of Coimbatore. Kovai Kondattam is a theme park in Coimbatore located 3 km away from Perur temple. You can reach there through Perur-Siruvani main road. It remains open from 10.30 am to 6.30 pm. You can visit this place with your family where your children can enjoy the numerous water games. The other adventure options available are rock climbing, water dance, wave pool, and dashing cars for small kids. Kovai Kondattam also arranges for birthday parties, casual get-together, presentations, product launches, and much more.